High Definition television sets are the in thing these days. After working hard to buy an HD-capable TV, what better way to maximize it by having a cable that brings TV viewing to a whole new level? Introducing... SKYcable HD, a service by SKYcable that provides delight in panoramic widescreen viewing. SKYcable HD offers 17 channels to date, namely ESPN HD, NBA Premium TV, HBO Hits HD, HBO HD, FOX Movies Premium HD, Discovery HD World, CN HD, Fox HD, Fox Family Movies, FoxCrime HD, National Geographic HD, HISTORY HD, Fashion TV HD, ASN HD, Star World HD, Outdoor Channel HD, Sky Cable HD. So maybe those channels have aroused your interest in availing of their service, huh? Why not take advantage of SKYcable's ongoing promo called the SKYcable HD Top Deals? With the SKYcable HD Top Deals promo, you can get discounts when you upgrade to a SKYcable HD Box within the promo period, and at the same time a free trial of the all the available HD channels. This will give you ample time to decide which specific channels you would like to avail going forward. Open to all new Gold and Silver SKYcable subscribers. Open to all existing Gold, Silver, SKY499, SKY280 subscribers. Subscriber must reside in Metro Manila (Las Pinas, Makati, Manila, Mandaluyong, Muntinlupa, Quezon City, Pasig, Paranaque, and San Juan) and in a SKYcable HD-serviceable area/location. A SKYcable subscriber can only avail of the SKYcable HD Top Deals offer once. Additional SKYcable HD box outlets are subject to the regular and prevailing SKYcable HD box installment fee. 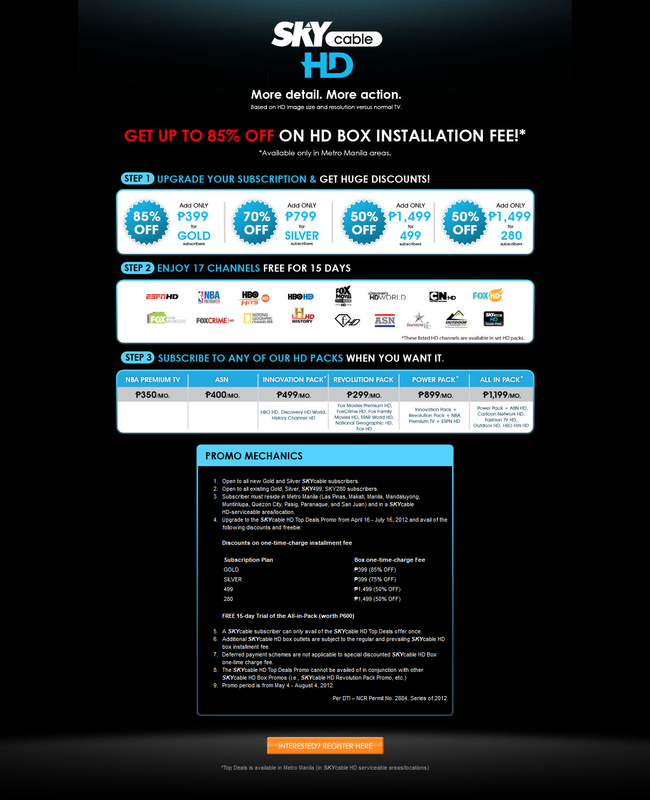 Deferred payment schemes are not applicable to special discounted SKYcable HD Box one-time charge fee. Promo period is from April 16 – July 16, 2012. For more details, visit SKYcable HD Offerings Website or sign up at for the SKYcable HD Top Deals Promo today!